With the help of the National Park Service, we now have all the fares and operating dates for the 2017 season approved. $106 for the first person in a room, $80 for each additional person. Open from June 27 through September 10. $222 for the first person in a room, $150 for each additional person. Open from July 9 through September 10. Reservations open on January 9th, 8:00am mountain time. The best, fastest, easiest way to make your reservation will be through this website. We are looking forward to hearing from you in the new year. Until then, enjoy your holidays! 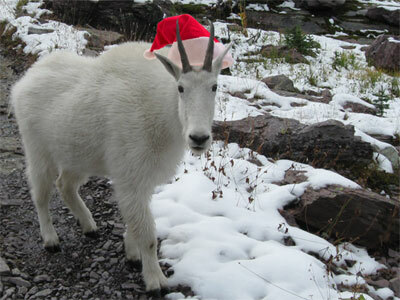 Merry Christmas from the backcountry of Glacier National Park. Reservations open on January 9th. 8:00am Mountain time zone. Granite Park Chalet will be open June 27 through September 10. Sperry Chalet will be open July 9 through September 10. We hope you will get a chance to come and visit. We will be on light duty at the office for a while. Send an Email if you need anything. If you are looking forward to the 2017 season, the date to circle on your calendar is January 9th. Reservations will open then. We will put information about our operating dates and rates on the website through the fall as we learn it. The trail closure on the Swiftcurrent Pass Trail was lifted Monday afternoon. Remember to hike with your bear spray in reach and remain alert on the trail. And now the bears are disrupting plans on the Swiftcurrent Pass Trail. If you were planning to come or go between Granite Park Chalet and Many Glacier, it would be best to come up with a plan B. It is always a good idea to check trail status reports either online or at a visitor center before you go hiking. We will let you know when our information changes. We would like everyone to know that the HIGHLINE TRAIL reopened at 1:00pm on Thursday, August 25. Starting Monday, we will be by the phone from 9:00am to 4:00pm. For your safety the Highline Trail between Logan Pass and Granite Park Chalet is closed. Closed on Friday, August 19th due to increased bear activity around a carcass found near the trail. We do not know how long this closure will last, but it will be best for everyone if we just leave the bears alone and not get too close to their little snack. Granite Park Chalet is open, we can be reached via The Loop Trail on the west side of the park, and from the Swiftcurrent Pass Trail on the east side of the park. The Highline Trail north of Granite Park Chalet remains open, and so is the Swiftcurrent Lookout. We still have lots of great hiking available, it has been a beautiful summer and we can’t wait to see you up here. You can also get up to date trail information from any park visitor center or entrance station. We will also share any info with you right here when we learn more about the Highline Trail. Happy hiking and stay safe out there. Did you hear? The Highline trail from Logan Pass to Granite Park Chalet opened this past week. There are still some patches of snow to cross, but they are melting quickly. No hazards to report at any of the water crossings. Be sure to get an early start and enjoy your hike. It has been a beautiful springtime here in Glacier National Park and we are super excited for your visit. Lets have some great hiking this summer! The Highline Trail from Logan Pass remains closed for dangerous snow hazards, but the Loop Trail is in great shape. There is some snow left at chalet elevations, so be ready with good boots and sunscreen. There is still more snow at higher elevations, hikes to Swiftcurrent Lookout will be ambitious for the next couple weeks. The Swiftcurrent Pass trail has some lingering snow too, be super careful if you try that trail. Be sure to check the trail status reports as you plan your hike. The Going to the Sun Road shuttle will be starting service on July 1. The chalet guest shuttle is running starting today. The shuttles are going to be a good idea this year because parking at the trailheads will be getting congested. If you have trouble reaching us by phone, we are probably helping other customers, try again in a few minutes. Lets talk about travel insurance. Granite Park Chalet and Sperry Chalet are two of the most unique hotels in our national parks. The wild location and primitive conditions provide both the charms and challenges of staying with us. When you venture into the wilderness to visit the chalets you are exposing yourself to some unique hazards that you would never encounter on other vacations. We want you to have a fun and safe hike, but Mother Nature could make you change your plans. Entering the wilderness is done at your own risk. The equipment you choose in your backpack can protect you from the wilderness, and travel insurance can protect you from financial loss. The chalets can not change cancellation policies due to acts of nature. We recommend that you talk with your insurance agent about travel insurance. We believe that travel insurance can be just as important for a wilderness vacation as your backpacking gear. Our pre-order menu is ready for you. We know Granite Park Chalet can be challenging to plan for, one way we can help is with food. Check out our menu of easy to make and easy to clean up meals. You may always feel free to pack in your own food, we have a great kitchen for you to enjoy. But if an extra snack sounds good or maybe you would like fewer things to carry in your backpack, check out our selection. It is easy to place an order online and we will have your order packed in by mule,waiting for you when you arrive. Glacier National Park is more popular than ever, and finding parking at the trailheads is more difficult than it has ever been. We want to help make your chalet visit easier with parking in West Glacier and a direct shuttle to your trailhead. Get all the details on our shuttle here, and call our office to reserve your ride. Our long time friends and chalet visitors may know or have crossed paths with Lanny Luding at some point. We are pleased to announce his retirement. Lanny started working for the chalets as a teenager in 1954 and has spent over 54 summer seasons caring for the chalets of Glacier National Park. After helping his parents operate the chalets in his youth, Lanny took time off to pursue an education and also spent time in the Army, serving in Vietnam. He returned to Glacier National Park and took over duties as the head of the concession in 1974. Over the years Lanny has done every job there is to do at the chalets, from washing dishes to bookkeeping. He has spent the last ten years offering guidance on our board of directors and assisting everyone here with his wit and wisdom. As of last week, he has officially retired from the board and all chalet duties. So far as we can tell, he intends to spend his new free time being a kid again. It is impossible to measure the impact Lanny has had on the chalets, his work has helped countless Glacier National Park visitors experience the backcountry in rustic chalet comfort. He is largely responsible for all our management techniques and the best practices we employ to this day. We cannot begin to express how important Lanny has been to the success of Sperry and Granite Park Chalets. We are pleased that the future of the chalets will be built on the foundation he constructed. Lanny, thank you for all you have done and your lifetime of service. We will miss you around here, but don't let that stop you from enjoying retirement. If you ever want to hike up for a visit I am sure we can find some dishes for you to wash.
Wow, we are once again impressed by how much enthusiasm everyone is showing for the chalets. We have heard from a lot of excited people this week and we have many more people yet to talk to. If you are still waiting to hear back on your reservation request, thanks for being patient. We are continuing to work through the queue as diligently as we can. We are being careful to create the best reservations we can. One thing we have learned this year is that Glacier National Park's popularity, with record setting visitation, is affecting the chalets too. We are seeing more demand for these tiny hotels than we have ever seen. If we are unable to honor your request, do please watch our website through the spring. We are expecting cancellations and changes to create some openings, they will be available first come first served. We are excited to get underway helping you enjoy the mountains and wilderness of Glacier National Park this summer! Here is some info that might help you with your reservation. Use the reservation request form on this website. This is the fastest and easiest way to submit a request to us. If you phone a request to us, all we can do is fill in the form for you. Watch your Email for our reply. If you need it, our office phone is: 888-345-2649. We can enter a request for you or answer questions, but we will not be able to create reservations by phone while we are backlogged. The phone line is expected to be very busy and you should expect busy signals and difficulty connecting. Common sense and statistics can help you some. The more flexibility in travel dates, the more possibilities for reservations exist. The fewer rooms you need, the more likely we will have them available. The first week in August traditionally has the highest demand. (The week before and after are very popular too.) Other dates may have more opportunities.